On Sale Now! Save 8% on the Whitmor Slim Rolling Household Cart - White by Whitmor at Momiji Studios. MPN: 6023-6001. Hurry! Limited time offer. Offer valid only while supplies last. The Whitmor Slim Household Cart is the perfect combination of style and functionality. Slip it between the washer and dryer or in a narrow bathroom. The Whitmor Slim Household Cart is the perfect combination of style and functionality. Slip it between the washer and dryer or in a narrow bathroom. This utility cart is ideal for organizing your towels, washing powders, and other household goods. 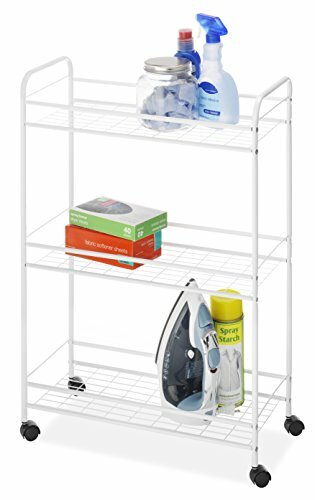 This cart features three shelves with raised edges to prevent things stored on them from falling. This utility cart has a unique style that will enable it to blend easily with your home decor. This utility cart features wheels on the base that allow it to move from one place to another easily. Made of durable epoxy coated steel, this utility cart is sturdy and long lasting and will last for many years. Whitmor is a 4th generation family-owned and operated business. Since 1946, Whitmor has been dedicated to bringing organization home by creating products that simplify everyday life. Ensuring that those products are built with integrity, value, and innovation is our commitment to you. And our promise is that we will always be here for you should you ever need us as we stand behind our product 100%. Whitmor customer service is available in English and Spanish Monday through Friday from 8am - 4:30pm CST. Call us and we will gladly assist you in your language. You may contact Whitmor toll-free at 1-888-944-8667 or via email at customer_service@whitmor. Assembled Dimensions: 9.25" x 20.75" x 30.5"
View More In Carts & Stands.